Can you feel it? It’s time for back to school! Isn’t that great?? I might not be in school anymore, but Jon is heading back to his second year of law school and I’m excited for him (even though he’s not feeling it yet). 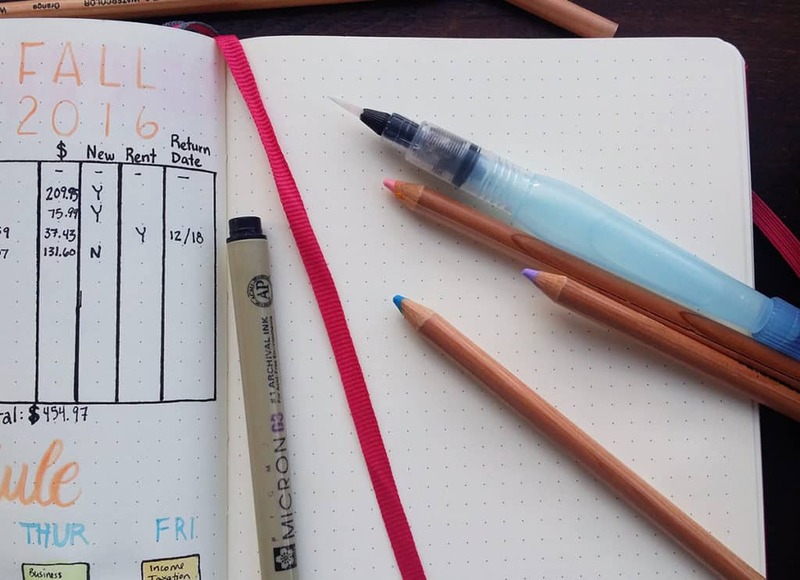 The rows of school supplies at the store, the return of friends, and the return to routine makes me really enjoy this time of year. 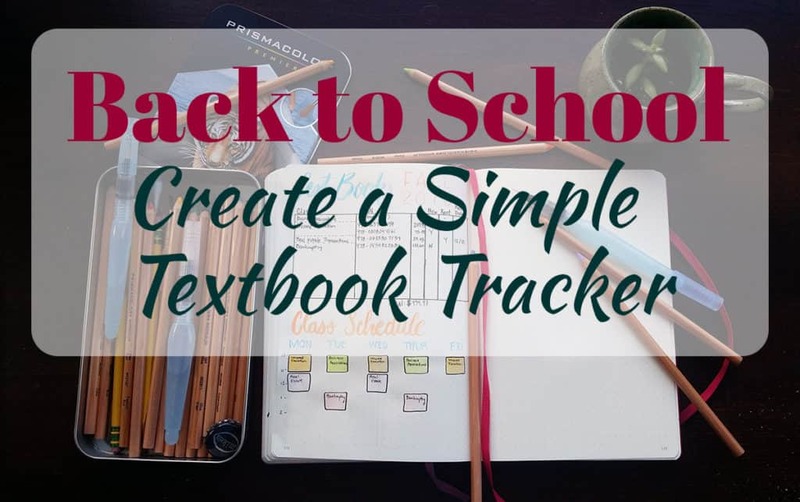 I thought this would be a great opportunity to show you a simple textbook tracker to help you organize as you prepare for the fall semester! But first, I have some new toys I want to show you. Remember in my Brush Lettering post where I said I had my eyes set on Pentel Aquabrushes? Well, I went and bought them! These are simply brushes with water in the barrel and lids for ultra portability and simplicity. Part of the reason I bought them was to encourage me to use my huge amount of watercolor paints. Naturally, I immediately starting lusting for new stuff to use with my brush pens, like these pearly Finetec paints. Craft only begets more craft! I’ve been playing with these little guys for almost a week now, and I finally got the nerve to try them in my Leuchtturm. I was afraid the pages would buckle and get all wavy, but they actually handled the water very well! As long as it didn’t get too wet, the paper was fine. I finally have an excuse to regularly use my huge collection of watercolor paints! I bought my Prismacolor Water-Soluble Pencils a few years ago for a Nature Writing class because we had to keep a nature journal as an ongoing assignment. Back then, I used these pencils in my Nepali Traveller, which had great paper for water work. Maybe I should dust it off and go do some nature journaling again! These Aquabrushes and my Prismacolor pencils are so ridiculously easy to transport, so I have no excuse. 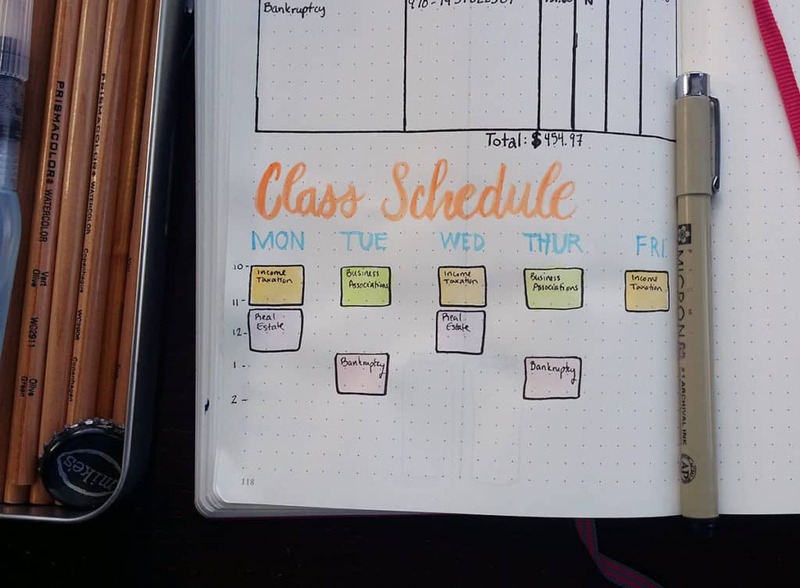 So now that I’ve gushed about my fun new brushes, I want to show you this easy little layout that can help you a ton with organizing your textbook and class information. One issue that I had over an over again during my time in school was with those darn textbooks. I would buy them or rent them at the beginning of the semester and then completely forget all the textbook information, which meant that there was a lot of guesswork at the end of the semester. One semester, I forgot to return a rented book by the due date and got charged a late fee. Yikes! The simple way to fix this forgetfulness is to just write it down already! 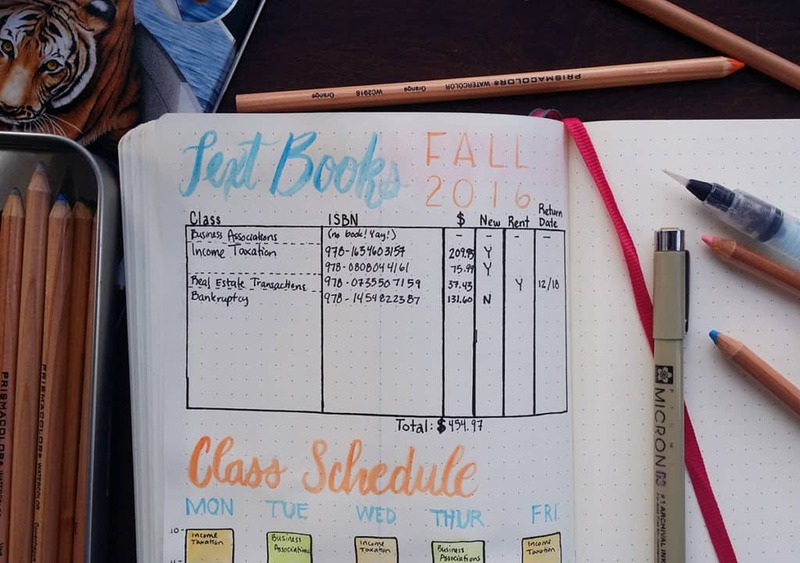 You can easily draft up a little chart in your bullet journal to jot down the important information for your textbooks. Easy peasy! Keep the ISBN, original price, and renting info all in one place so you know where to look later on. I drew out this chart with my Micron pens and left enough room for twelve books. I hope for your sake you don’t have twelve books. Remember that Nature Writing class I mentioned earlier? That beast of a class had a list with at least eight different books. I mean, there were a few goods books in there, despite the sheer volume. Like A Trail Through Leaves and The Orchid Thief – I know it’s way off topic here, but I feel like not enough people know about these and I genuinely loved them. Anyway, I thought I would mention that one way to cure your textbook troubles is with Amazon’s Textbook Buyback program. (You can also trade-in normal books, electronics, and cellphones!) You can trade in used textbooks (and lots of other stuff, too) for a pretty penny and ship it to them for free. I’ve used it before and I’m telling you, it works. It’s so much better than your school’s bookstore. Of course, some books aren’t going to fetch a great price because of whatever reason, but a little money is better than no money! And of course, you can rent your books from Amazon, too. Amazon is just really awesome. These might be affiliate links, but I can vouch 100% for both of these services. Amazon made my college years a bit easier with their convenience and customer service. I think you will love what Amazon has to offer, and if you’re a student you can get 6 months of Prime for free! Since the textbook tracker only took up half the page, I decided that the bottom half of the page would be a great place to jot down Jon’s class information. If you would prefer to use a whole page for this, be my guest! Jon (thankfully) has a pretty light schedule this semester, so it was easy to squeeze into this space. I just like knowing his class schedule so I know what to expect each day. I drew out the boxes for his classes and color coded them with the Aquabrushes and the Prismacolor pencils. The fine tipped Micron was great for writing in these little boxes. Like I said earlier, the paper took it really well. Here’s the back of the page where my vertical dailies are still in tact and totally usable. Leuchtturm makes a mean notebook, I’m tellin’ ya! Also, kudos to Tombow brush pens for not freaking out when moisture is applied to the ink. I’m very impressed all around! If you’re curious why there’s a Mike’s bottle cap in my pencil tin, let me explain. Nearly our friends are law students, so I bring activities to our outings just in case they start talking about the law – which happens a lot. This results in drunk painting. Don’t knock it till you’ve tried it! There you have it! 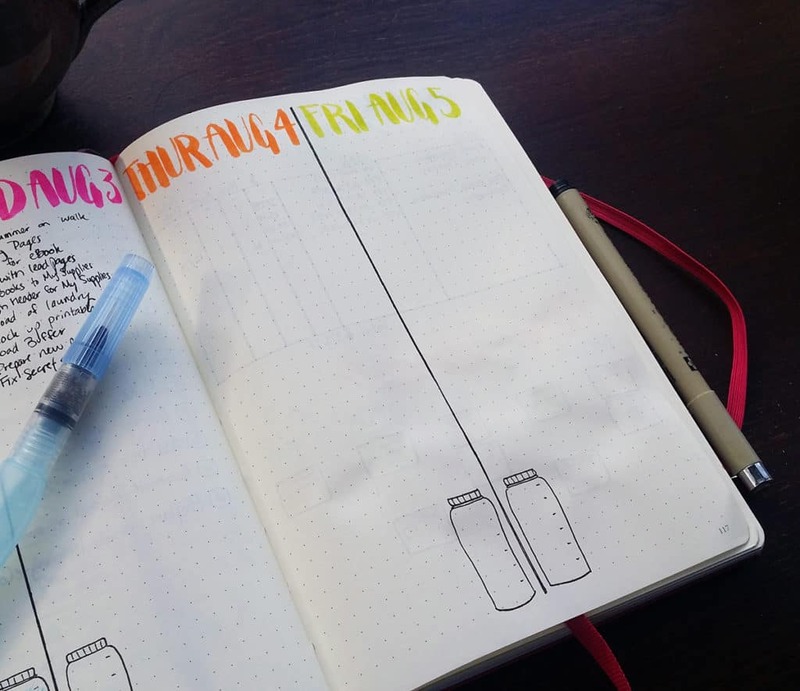 My super simple little tracker might be exactly what you need to make your end-of-semester apathy a little better. Sometimes simple is the best answer. As we move away from summer and toward autumn, I want you to bask in this lovely time of year and remember to enjoy yourself. School doesn’t have to be all books and studying. You can be a good student and have fun at the same time, so don’t take it all too seriously. Good luck with your fall semester! P.S. 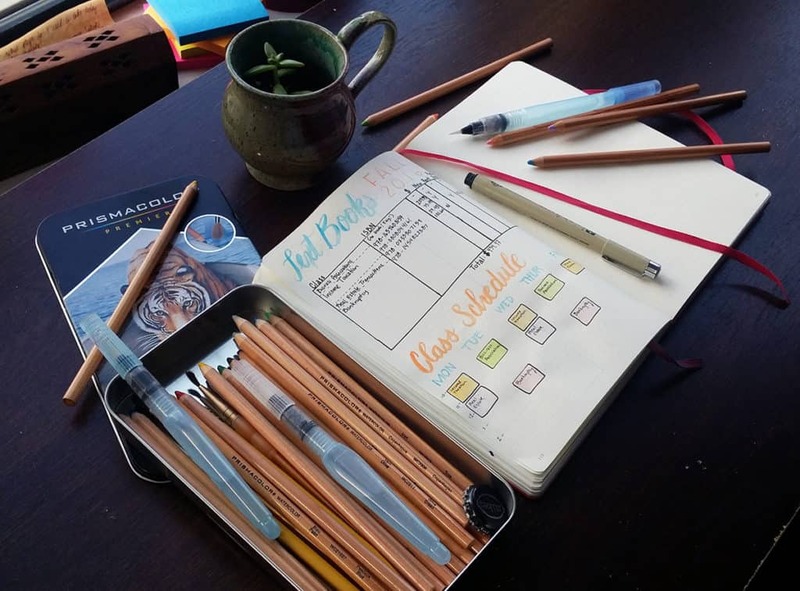 If you want access to free tracker printables, sign up for the Fox Den Resource Library and get your free goodies today!